Nearly every person I know who I confess my love of Istanbul to agrees: there’s something magical about this city on the Bosphorus. Lazy writers would say it’s because it’s a place where East meets West – where Europe and Asia make eyes at each other over nothing more than a simple river. Others would say it’s the way that empires have bumped up against each other over millennia, creating a rich patchwork of tradition and architecture. Or perhaps some would say Istanbul has an invincible feel to it, built atop the bones of Constantinople. For me, though, my love for Istanbul rests in the little things. 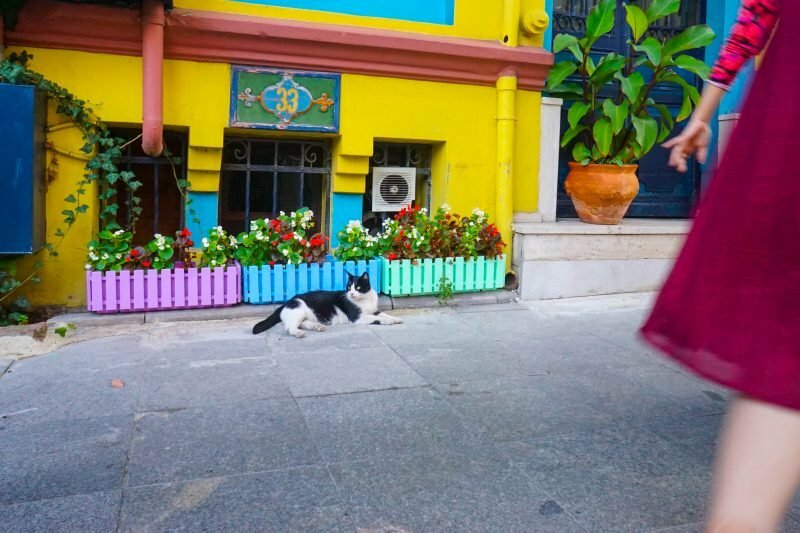 It’s the way that the locals care for the street cats as if they were their own, even going so far as to build them houses to protect them from freezing in the harsh Turkish winter. It’s the way that the minarets reach for the sky, stretching against the domes that silhouette black against the horizon as the sun sets. 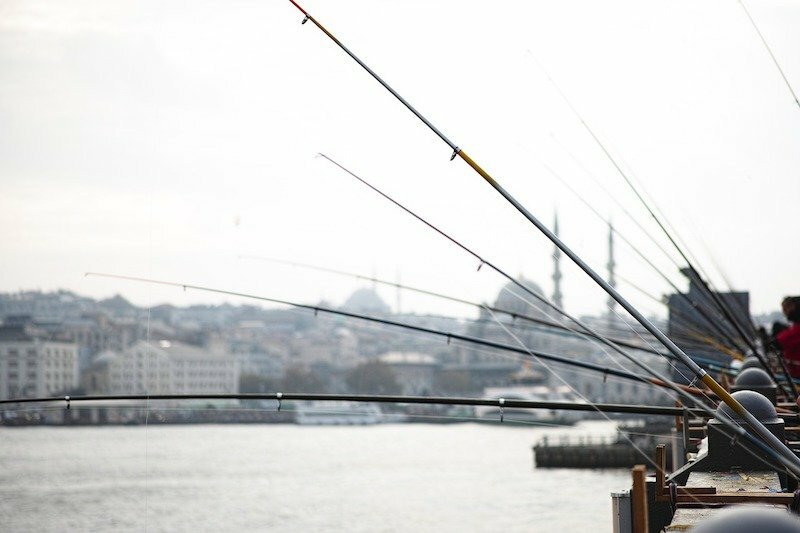 It’s the dance of hundreds of fishing poles, dipping off the Galata Bridge all day long. It’s the delicate way you have to learn to sip sweet, strong black tea from tulip-shaped glasses so you don’t burn your fingers. I’ve spent a cumulative two weeks in Istanbul over the past years, and surely will spend even more time there this year. While I’d love to tell everyone they need to stay at least a week, more realistically, 3 days in Istanbul is a good place to start. It gives you a taste for the city, but still leaves you with plenty of time to explore the other wonders of Turkey like Cappadocia, Pamukkale, and the beautiful coastal cities like Fethiye, Antalya, and Bodrum. 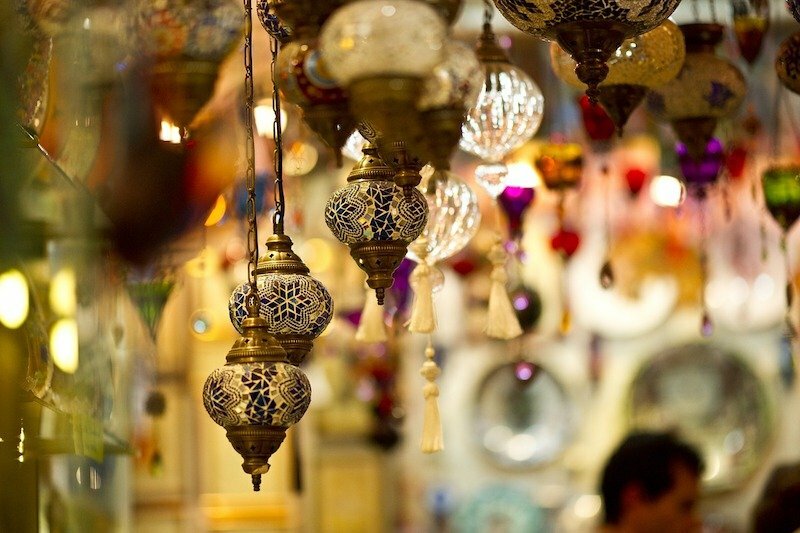 Shop guided excursions to other Turkish delights! And trust me — as 3 days in Istanbul is not anywhere close to enough, you’ll come back wanting more. It’s nearly impossible not to. The majority of Istanbul’s sights are located on the European side, on the Golden Horn in the neighborhood called Sultanahmet after its main mosque. This fortunately makes sightseeing extremely convenient, as virtually all places are within walking distance of one another: perfect if you only have 3 days in Istanbul. If your feet get tired, however, taxis are cheap and I’ve never personally had any problems with Istanbul cabbies, unlike in other cities – though like all of the Balkans, Turks are notoriously insane drivers! For centuries, Istanbul was the heart of the Ottoman empire and the ornate residence of its sultans, who built up Topkapı Palace into the extra masterpiece which still stands today. 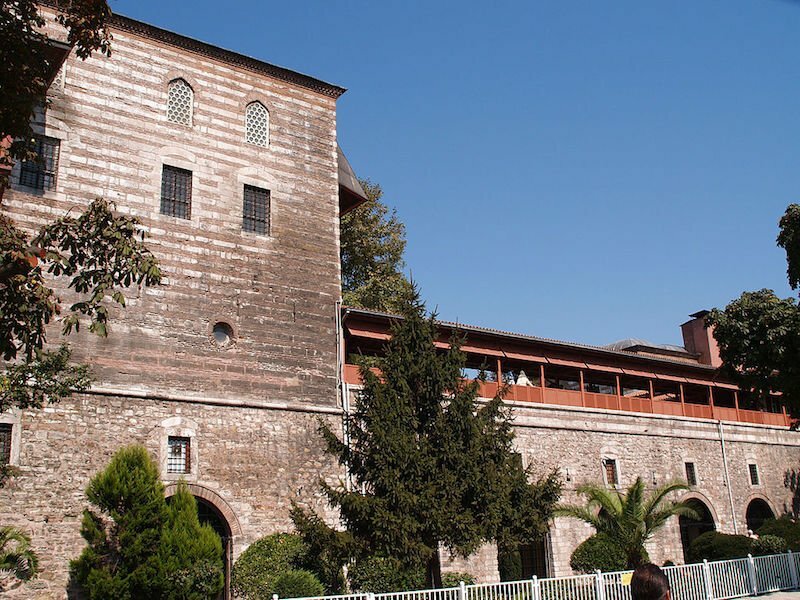 At over 500 years old, the palace is now a museum which showcases the older Ottoman architecture that was commonplace in Istanbul many centuries ago, preserved in remarkable condition. One of Istanbul’s most famous structures, the Hagia Sofia showcases over 700 years of Istanbul’s history expressed through its architecture. Initially, it was home to a large church before being converted into a mosque during Ottoman times. 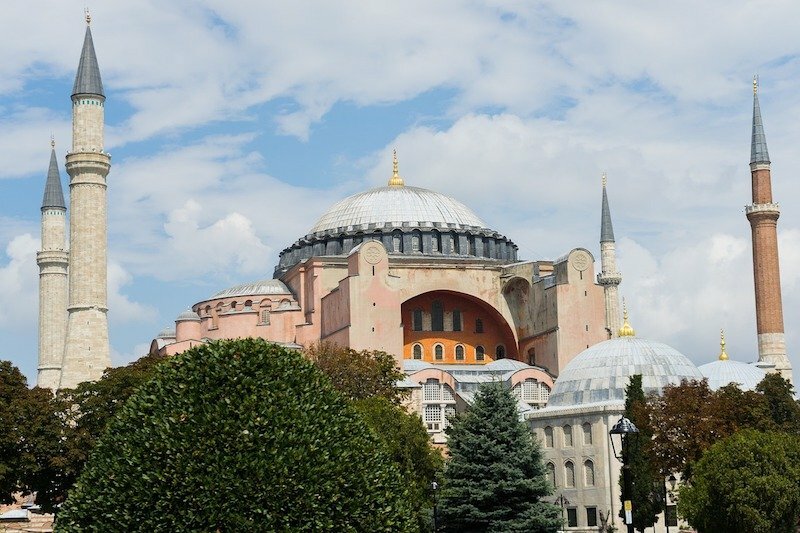 Still, despite the conversion, the Hagia Sofia retains many hallmarks of its original purpose as a church, including some stunning mosaics on the upper level portraying Jesus, the Virgin Mary, and various saints. It was covered up with plaster for centuries when the church was converted into a mosque by Ottoman rulers, as the depicture of icons and human figures is forbidden in Islamic art. But these mosaics were uncovered in the 1930s and preserved as part of a museum, thanks to the secularism that flourished once the Ottoman empire broke apart. As Hagia Sofia is a museum, not a mosque, there is no dress code for entrance. However, when I went for the second time in September of 2017, there was a lot of reconstruction work and scaffolding, so be prepared that it may not look like you imagine it! Just opposite the Hagia Sofia, the Sultanahmet Mosque is more frequently known as the Blue Mosque because of the iconic blue İznik tiles decorating its interior. At over 400 years old, the mosque stands the test of time and is still in pristine condition. It’s still a functioning mosque, and therefore visitors are not allowed in during prayer hours (you can check them online here). 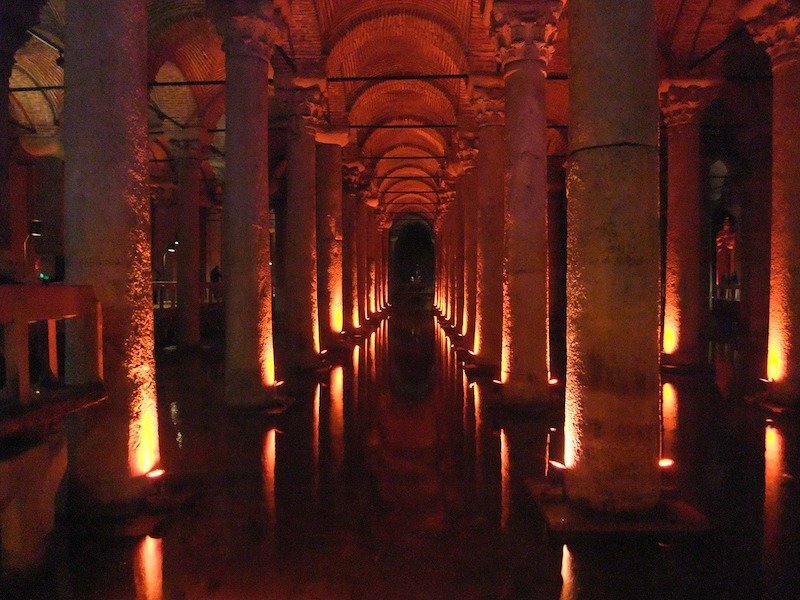 Tip: if the Blue Mosque is closed for prayer, check out the Basilica Cistern (below) while waiting for it to reopen. Modest dress is required, but it’s incredibly simple and free to borrow modest clothing from the mosque if needed. Just grab them from the office around the back entrance before lining up to enter. Don’t let these restrictions put you off: the inside of the mosque is truly stunning. It’s an incredible experience to get to see the original tile work, the massive chandeliers, the ornate calligraphy, and all the hard work that has gone into the creation of this masterpiece of Islamic architecture. At night, you can see the six minarets lit up and it’s truly spectacular to see from a distance. 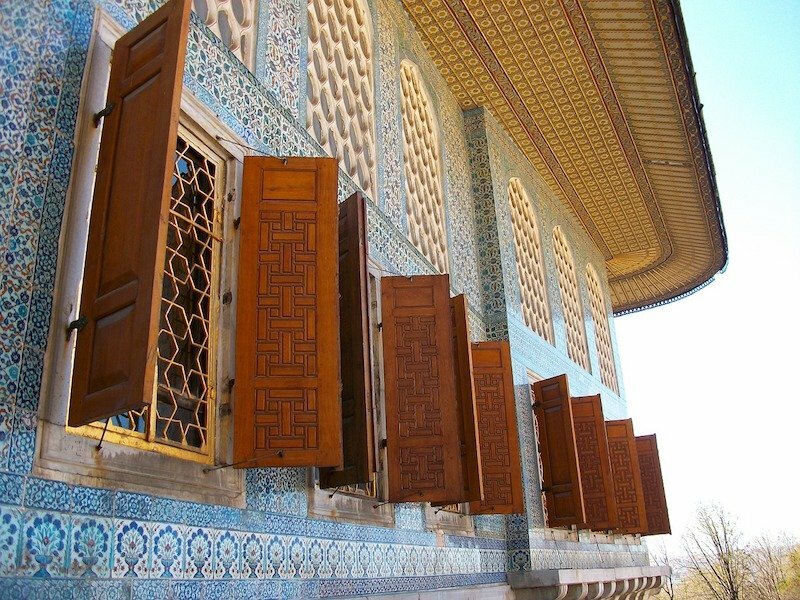 If you’d like to do a guided tour of Topkapi Palace, the Blue Mosque, Hagia Sofia, the Hippodrome & Grand Bazaar, you can shop affordable guided tours here. Just a few minutes’ walk from both the Blue Mosque and the Hagia Sofia, the Basilica Cistern provides an underground experience that sends you back in time. A cistern is an ancient aqueduct — and these cisterns are just about as ancient as they get, 1500 years old and straight out of the Byzantine era. Created by 7,000 slaves, the cistern stretches over an area of two back-to-back football fields, with over 300 different columns arranged in perfect symmetry, supporting the 30-foot-high ceiling. But the most unique thing about the Basilica Cistern is the two heads of Medusa inside it: one upside down, the other sideways, at the base of two pillars. No one knows exactly why – some think they were stolen from an old pagan temple, others that they were silently critiquing their Byzantine overlords. But down in the cistern, listening to the subtle drip drip drip of water while staring at the twin heads, I was glad to not know: some things are more special with a bit of mystery. Even if you think you’re not much into Islamic art, I highly recommend visiting this museum, as it’s one of the most excellent art museums in Turkey. Due to the ages-long presence of Islam, which prohibits iconography, a distinct art style developed in Turkey. Here, you’ll find ceramics painted with calligraphy and stunning centuries-old carpets stretching tens of meters high against the walls. Historical art, as well as that of newer artists, can be found here, in a museum which was once a palace. It’s also just steps away from Hagia Sofia and the Blue Mosque. My personal favorite section of the museum is part that showcases reactions of homes from different time periods and regions of Turkey, giving you a true sense of what life was like for Turks throughout the ages. Once the racing grounds for chariots and other ceremonies, there’s not much left of the Hippodrome. But fans of history will admire some of the statues and obelisks which still stand. The most noticeable of the three is the Egyptian obelisk, complete with hieroglyphs, and dating back nearly 3,500 years. There’s also the walled Obelisk, “young” at only a thousand years, and the strange Serpentine Column which is just the base of a larger structure that have since been destroyed or partially preserved in museums. 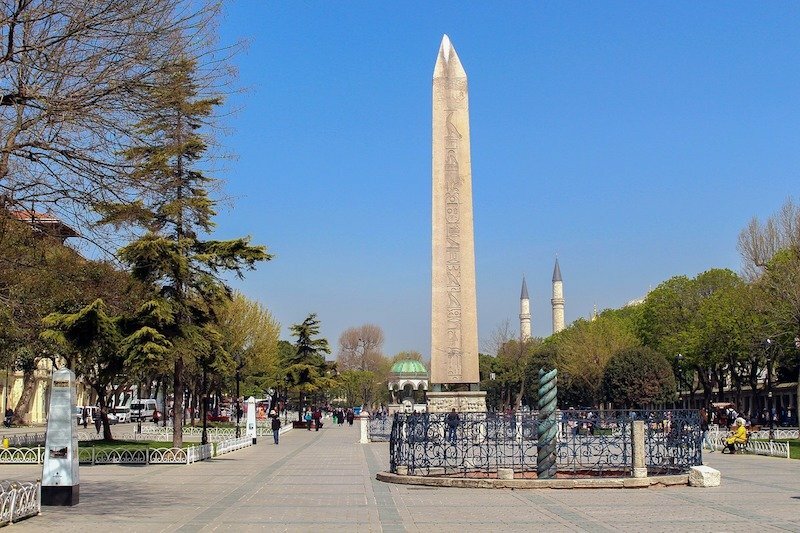 Sultanahmet is a great place to visit by day. By night, though, the whole neighborhood dies down except for the touristic restaurants selling just-decent kebabs and other Western-friendly fares. If you want to really see the real Istanbul by night, check out the district of Beyoğlu for more traditional food in the meyhanes. 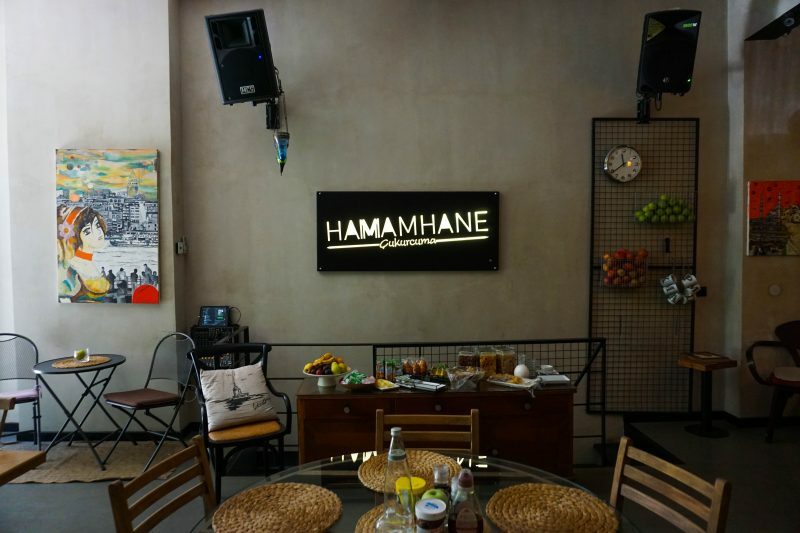 Meyhanes are simple, lively restaurants – kind of like an Italian trattoria. The menu is focused on mezes, an assortment of salads, dips, seafood, and of course, the Turkish national drink: rakı, an aniseseed liquor that turns milk-white with the addition of water. Visiting a meyhane is a must if you want to get a sense of modern Turkish identity. 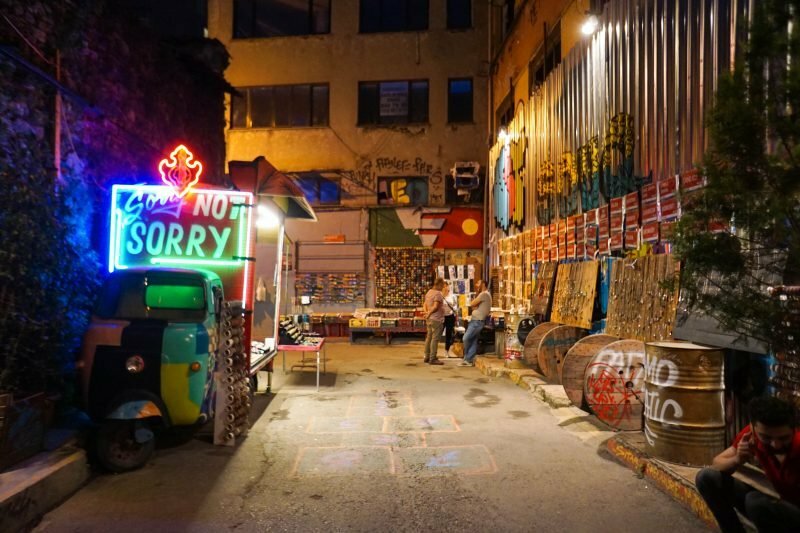 If you’re looking for a hipper place to be, there are tons of trendy restaurants and bars in Karaköy and Cihangir, which is where the European side of Istanbul comes to life at night. Another popular activity in Istanbul at night is to attend a performance of the whirling dervishes, a unique religious dance specific to Turkey. You can purchase tickets for a whirling dervish performance here. 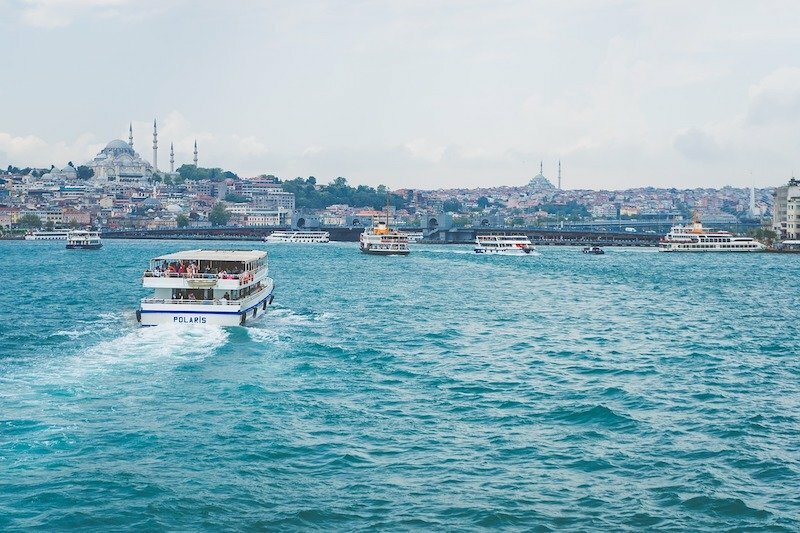 Another popular choice is doing a Bosphorus river cruise, which includes dinner, drinks, and entertainment as you cruise between Europe and Asia (tickets sell out often and can be purchased here). There’s so much to see in the Golden Horn that I can’t have you leave just yet! 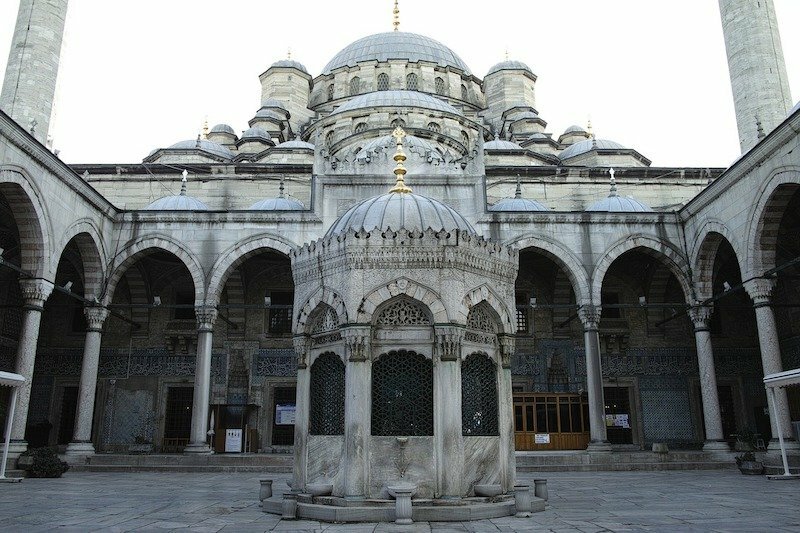 Your second day in Istanbul should involve around seeing the famous markets, mosques, churches, and old city walls that are just a bit further east of the main tourist heart of Sultanahmet. With the exception of the Grand Bazaar, these places are a bit off the main tourist track (that’s not to say that you won’t see any tourists – just that they won’t be as slammed as the main Sultanahmet area). Entering into the Grand Bazaar is sensory overload – the only thing comparable I can think of are the Moroccan souks. Over 60 different streets of markets spread out across this bazaar, welcoming you into a world that has been mostly unchanged for hundreds of years. The Grand Bazaar operates in hyperbole: it’s one of the largest and oldest open-air markets in the world, dating all the way back to 1455 and having been in operation every single day since the founding, holidays, wars, and all. A note so that your trip to the Grand Bazaar is pleasant: Come with a steel resolve on what you do or don’t want to buy, and be polite but firm. Especially now that Turkey’s tourism is suffering, shopkeepers will be especially persistent. Understand that accepting complimentary tea from a shopkeeper may result in them thinking they are more likely to make a sale, so if you accept, be aware of that their persistence will likely increase. Don’t take advantage, but don’t let them take advantage of you, either! Should you choose to purchase anything, haggling is expected. Check out this guide to haggling to be sure you have a pleasant experience. About a 10-minute walk from the Grand Bazaar, you can’t miss the Suleymaniye Mosque. 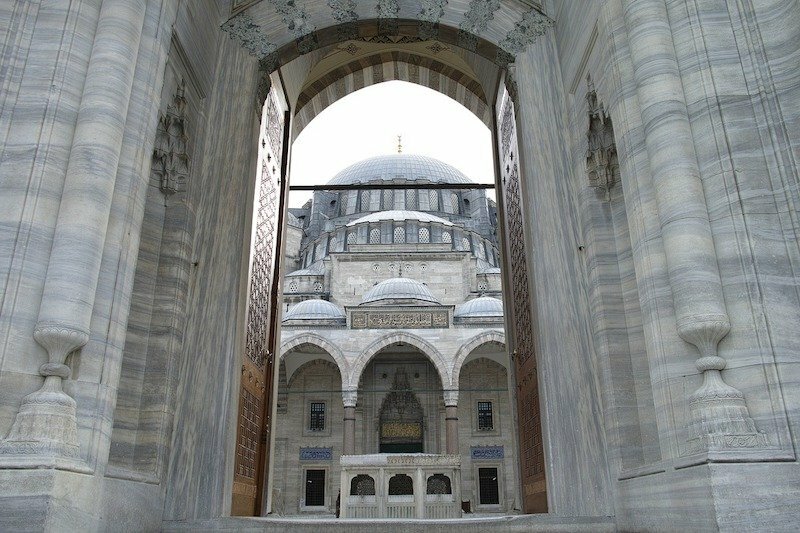 To be honest, I prefer it to the Blue Mosque – not as many tourists visit it, and I found the calligraphy on the inside to be even more beautiful than Sultanahmet. Rising above much of the city on a hilltop, Suleymaniye Mosque is one of the best-known sights, even if tourists don’t often know its name. Built in 1558, the mosque has remained in operation for nearly 500 years. Just like with the Blue Mosque, it is open to the public when prayers are not being held. I believe modest clothing can be borrowed here as well but I last visited this mosque in the winter of 2012 – dressing modestly sure isn’t a problem in a cold Istanbul winter! You can enter for free or take a guided tour if you prefer to hear the history. This church deserves far more fanfare than it gets — even my friend who is a born and bred Istanbullite has never been! While the mosques of Istanbul are impressive for their grandeur and get most of the visitors, the Chora Church is a bit outside of town and is barely visited at all. You’ll have to take a taxi from Sultanahmet or take a bus from Eminönü to Edirnekapi and then walk about 10 minutes. But don’t let that fool you – I was blown away and truly touched by this church. Over 1600 years old, the Chora Church offers a look at ancient architecture and houses some of the most impressive Christian-inspired mosaics in all of Turkey, if not the world. The painstaking detail of the gold leaf mosaics that fill and embellish nearly the entire ceiling is simply breathtaking. Similar to the Hagia Sofia, the Chora Church was once a monastery, then was converted into a mosque, and is now a museum. Just another example of how modern-day Turkey respects its multiculturality and preserves its past, rather than blindly following tenets and destroying its history in the process. Luckily, the Chora Church is right nearby another sight worth seeing – the former city walls of Constantinople, dating back all the way to the 5th century, are just a few minutes’ walk away. It’s possible to climb the walls and walk along it, which I highly recommend doing not only for the views, but for the awesome bragging rights of getting to say you walked the walls of Constantinople. I’ve heard that it’s not so safe to be there after dark, as robberies may occur. When I went in February of 2012, I watched the sunset from there and left before it got dark. I felt perfectly safe, but as always, keep your wits about you and trust your gut. 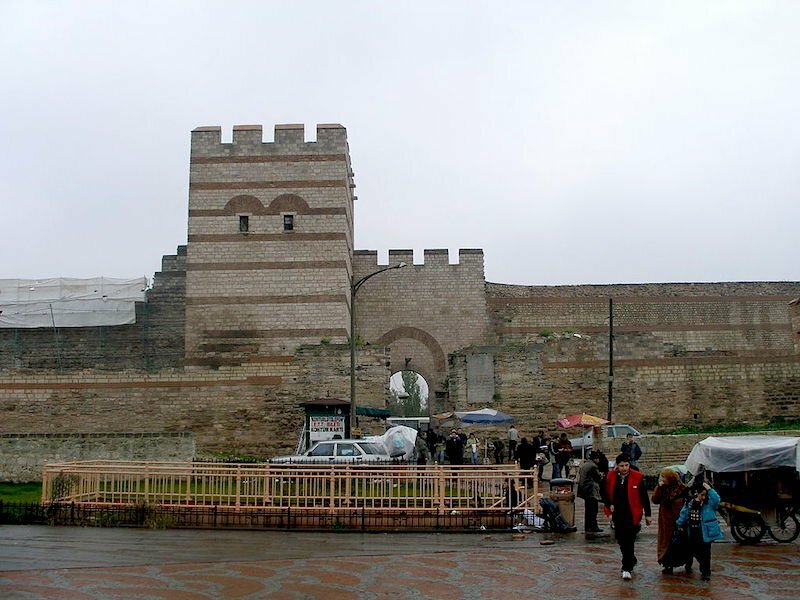 Asitane is located super close to Chora Church and the walls of Constantinople so it’s often recommended in guidebooks. 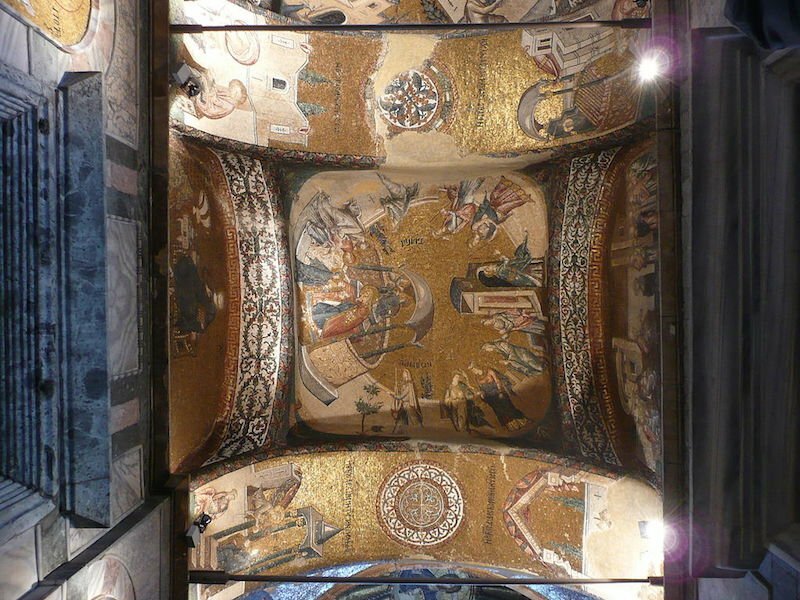 I went after visiting Chora Church in 2012 and it didn’t disappoint! The idea behind the cuisine of Asitane is adaptations of Ottoman dishes that would have been served to the royalty at palaces like Topkapı and Dolmabahçe. The chefs recreate old recipes using modern techniques and ingredients. The result is something way different than you’ll find at your average kebab-shilling restaurant in Sultanahmet. I had a delicious almond soup and a lamb stew cooked with apricots and raisins (and it was seriously that good that I’m remembering it 6 years later). A bit pricier than most places in Istanbul, but well worth it. 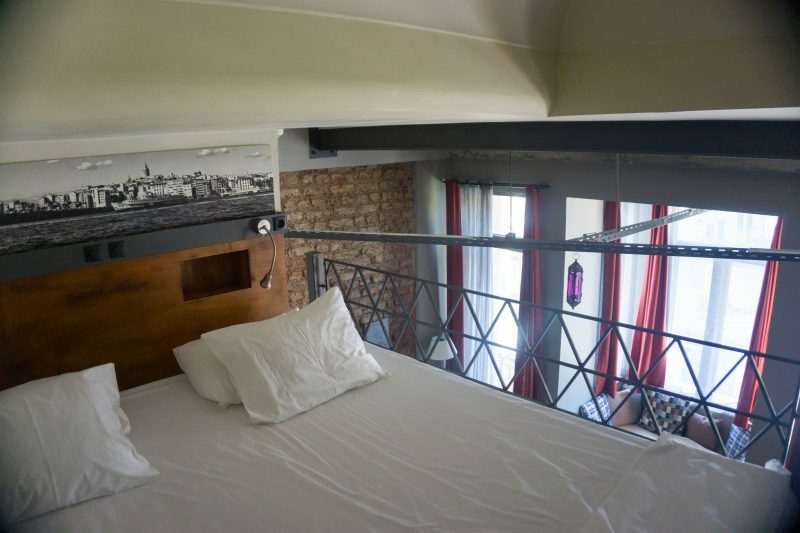 You could also relax with a Turkish bath experience (traditional hammam), do a Bosphorus river cruise, see a show, or enjoy drinks on one of Istanbul’s many excellent rooftop bars (I recommend the rooftop bar at the Marmara in Taksim). Taksim Square is the center of young Istanbul. Known as the hub of Istanbul for amazing nightlife, great food, and rooftop views overlooking the city, this district offers everything you could want while traveling. Start your day in Taksim Square as it’s an easy starting point, then work your way down Istiklal Caddesi. The pedestrian avenue of Istiklal Caddesi has been loftily called the Champs-Elysees of Istanbul — that’s a bit much. It is, however, one of the best places to shop in Istanbul if you’re looking for international retailers and good sales. The slumping Turkish lira – a bane for Turks – means a favorable exchange rate for visitors. I snapped up some great T-shirts for about 3 bucks apiece. 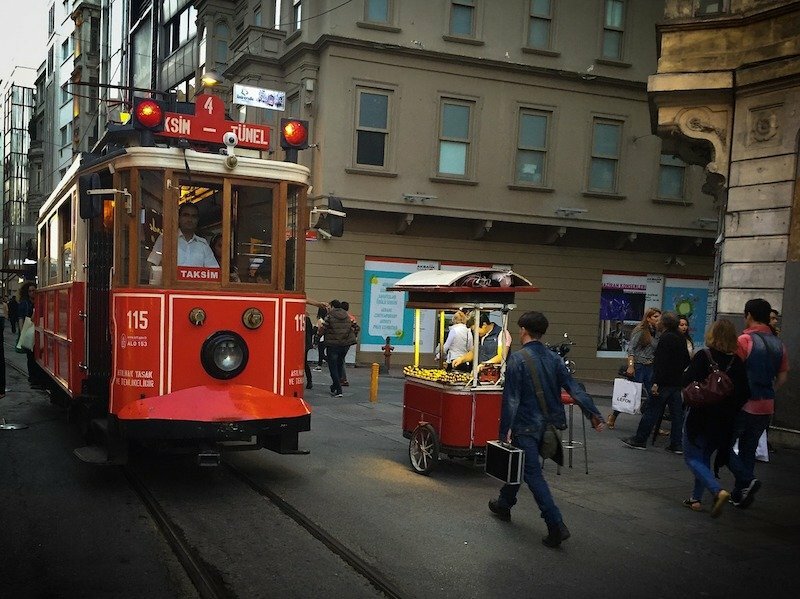 Normally, there’s an adorable vintage tram that goes from Tünel to Taksim. Unfortunately, when I went in September 2017, it was under construction, but I’ve been told that as of January 1st it’s been completed and running as usual. 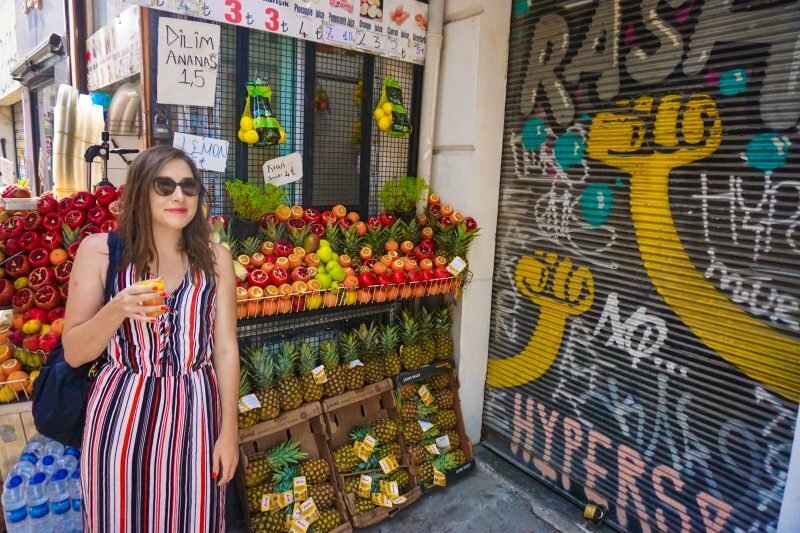 But I advise you to take the opportunity to walk around Istiklal and its many side streets, as it’s one of the most iconic streets in the city for a reason. There are countless places to stop for a cup of tea or Turkish coffee. Don’t forget to try the pistachio baklava at one of my favorite bakeries – Saray Muhallebicisi – and to get the fresh orange or pomegranate juice from any of the street stands! Çukurcuma is the name of the tiny antiques neighborhood in Istanbul’s Beyoğlu district, near the hipster neighborhood of Cihangir. It’s one of the best neighborhoods to shop in in all of Istanbul — from modern, world-inspired designs to antiques bursting out onto the streets, you’re bound to find something for your home. If you’re walking down Istiklal, turn right after you reach Galatasaray Lisesi (the big yellow high school) and go down the hill. 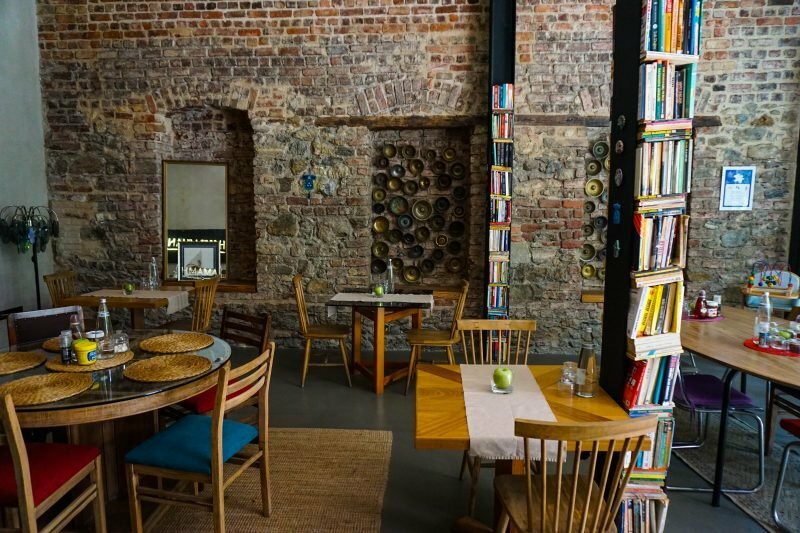 There, you’ll also find tons of adorable coffee shops and cafés perfect for taking a quick coffee break. 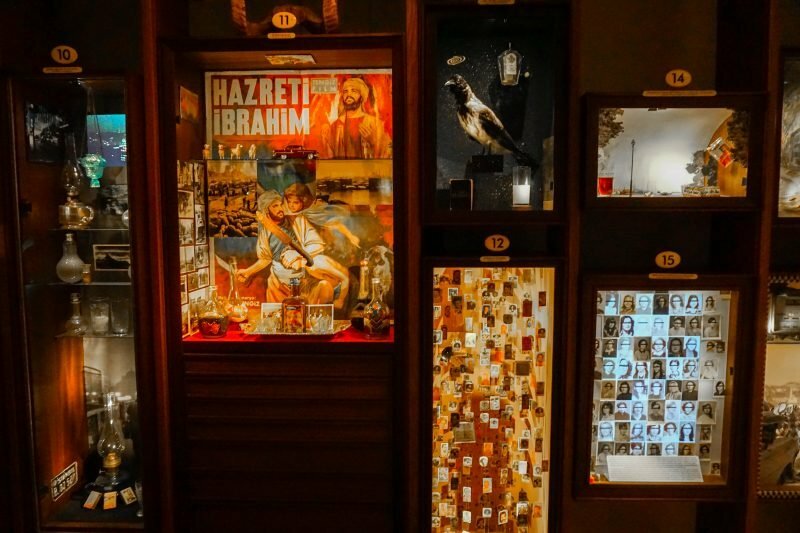 Optional, but one of my favorite places in Istanbul: the Museum of Innocence on Çukur Cuma Caddesi. This museum was built to accompany Orhan Pamuk’s incredible novel of the same name. It features everyday objects from 20th-century Istanbul life, lovingly arranged into vignettes which track with the progression of the novel. The audio guide reads chapters from the book or shares Pamuk’s thoughts in creating these story boxes. To be honest, if you haven’t read the book, I’m not sure how much you’ll get out of the museum, but for me, I was moved to the point of tears. The Museum of Innocence is one of my favorite books of all time, so I found it to be the most special place on my recent trip to Istanbul. 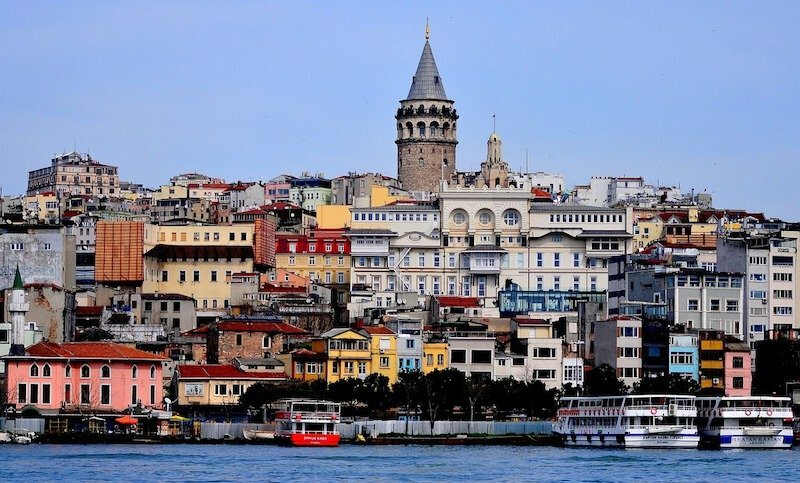 If you want a panoramic view of Istanbul, there’s no better place than the Galata Tower. The only problem is everyone else agrees: lines can be long, and you can expect to wait at least an hour. Dominating the skyline at over 200 feet high, this steepled tower has a 360-degree observation deck. so you can see virtually all of Istanbul: the Golden Horn with its many mosques and minarets, the brightly-lit Bosphorus bridge connecting Asia and Europe, the skyscrapers of Taksim. Contrasting with many of the buildings around it, the tower was made in a Romanesque style, making it unique and easily noticeable against the more Islamic-inspired Istanbul skyline. It’s built on a hill which adds to its height, making it immediately noticeable from points along the Bosphorus. I loved going at sunset, but the lines are longer then, so choose as you’d prefer. Coming down to the edge of the Bosphorus, you’ll find the Galata Bridge with its dedicated fisherman and their trusty poles bobbing in the water nearly any time of day. It’s a great place to take photos as you walk from the Galata side to the Golden Horn side. On the level of the bridge below, there’s a number of fish restaurants- all seem identical in offering, name, price, and customer service pitch – though if you’re in the mood for freshly caught fish from the Bosphorus, there’s no shortage of fish restaurants in the area. 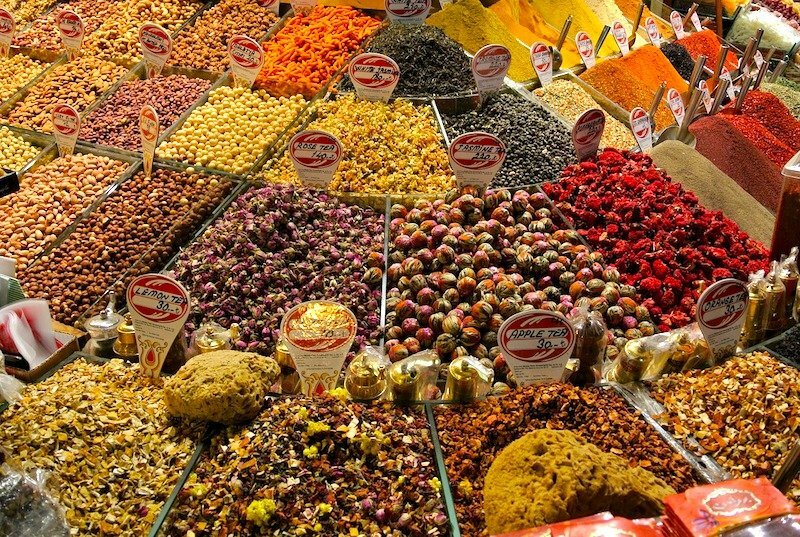 Just as you cross Galata Bridge, you’ll find the Spice Bazaar (also called the Egyptian Bazaar). This market has been in existence since the 17th century, nestled right next to the Yeni Camii (New Mosque) which is worth a visit if you’re not mosqued out by now. This place is far less hectic than the Grand Bazaar, so it’s a good place for the timider amongst us. You can buy all sorts of goodies for others (or who are you kidding — yourself!) here like Turkish delights, Turkish coffee, spices, and teas. It’s supposedly a good place to buy saffron, but I don’t really cook so I don’t know anything about that. If you’ve just finished up at the Spice Bazaar, you’re at Eminönü now — which means you’re only 5 Turkish lira away from one of the best views in the whole city. This itinerary has been light on the Asian side of Istanbul — it’s the side I admittedly know less well. But I do know enough to know that you shouldn’t miss the ferry ride nor the neighborhood of Kadıköy, which is another going-out hotspot in Istanbul! The ferries depart from Eminönü about every 20 minutes and take about 35 minutes to reach Kadıköy. You’ll want a window seat — the views are stunning and even better with a cup of Turkish tea in hand, which you can purchase on board. Kadıköy is to the Asian side of Istanbul as Beyoğlu is to the European side, its young, modern heart. There’s plenty to see here that honestly, it warrants a whole day (but I didn’t want to jam too much into this already insane 3 day Istanbul itinerary). So why not at least get a taste for it by night? And by that, I do mean taste – it’s truly a heaven for foodies. If you have time, check out the Kadıköy market, one of the best, most local markets in Istanbul. There are countless tea gardens and restaurants serving creative spins on Turkish fare here as well. I highly recommend doing an evening food tour of Kadıköy to cap off your time in Istanbul on a tasty note! Once you’ve eaten, either independently or on a food tour, head to Kadife Sokak, aka “Bar Street”/Barlar Sokak — it’s the heart of nightlife on the Asian side. Both times I’ve been to Istanbul I’ve stayed in the Beyoğlu district and never once regretted it. 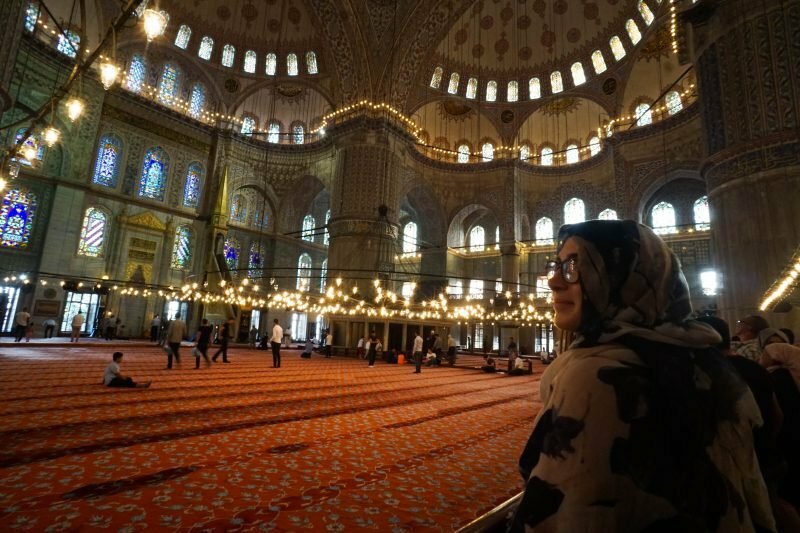 It’s perfect for first-timers: it couldn’t be easier to visit all of Istanbul’s main sights from there and there’s so much going on all times of day so that you’ll never be bored, whereas in Sultanahmet pretty much everything shuts down after dark. Beyoğlu is broken into several different neighborhoods – Galata, Pera, Cihangir, Taksim, Çukurcuma, Karaköy, amongst others – each with a super distinct feel. Pera is one of my favorite neighborhoods – it’s super central, but also a bit more upscale than other neighborhoods in Beyoğlu which skew more hipster (like Karaköy and Cihangir). I started my most recent stay at the lovely Peradays Hotel, a small boutique hotel offering large, lofted rooms and — it being Istanbul, of course — some of the friendliest in-house cats, named Pera and Daisy. Aside from its resident cats, the best thing about Peradays has to be the amount of space you have to spread out and relax. Because the bed is lofted, it had space for a full couch, a reading nook set inside the window, a desk, a bookshelf, and a kitchenette. It was the perfect amount of space for two constantly traveling girls and all their stuff. The design is not fancy, but rather homey, and I loved how warm it felt. 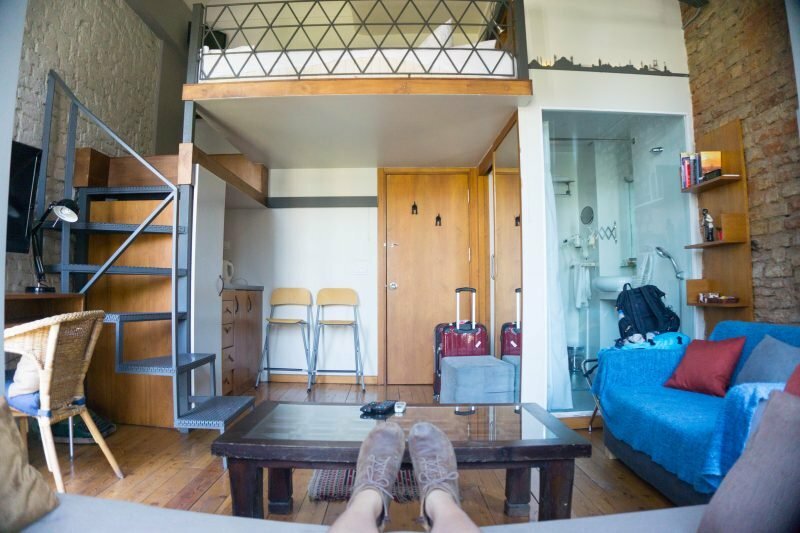 It combined the coziness of an Airbnb with the comfort of a hotel (and a delicious breakfast). The staff was extremely helpful and gave lots of tips on where to eat and what to see, and even helped me find a fantastic dentist when I started to get a toothache! See if there’s availability at Peradays here. 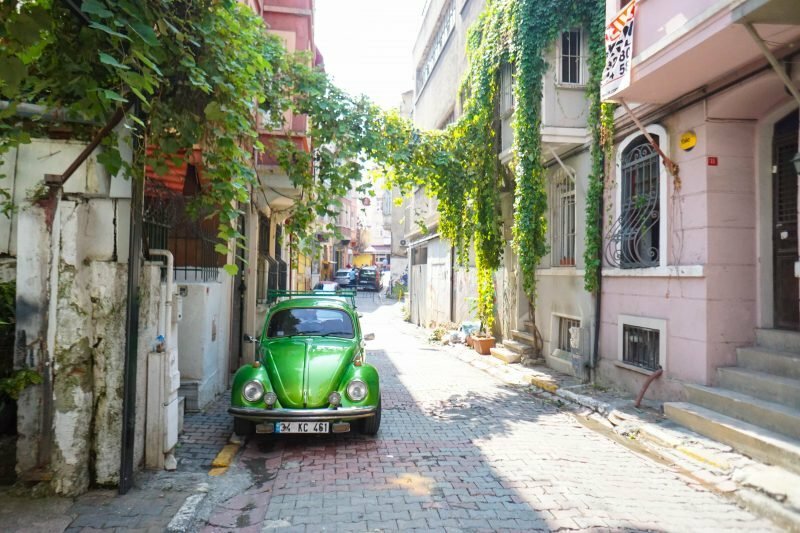 If you’re looking for a more funky neighborhood to stay in, consider Çukurcuma. 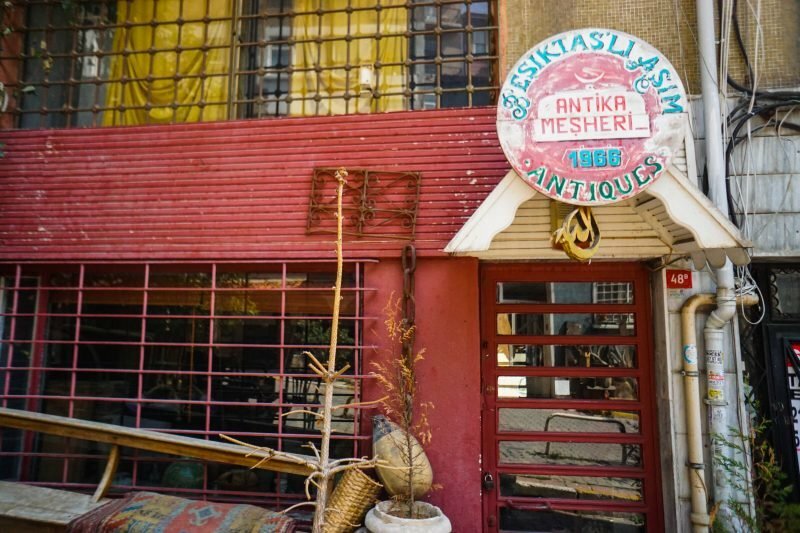 This tiny little antiques district is a micro-neighborhood of Beyoğlu (in fact, even a friend of mine who lived in Istanbul for three years had no idea what I was talking about when I talked about this neighborhood! ), but it’s becoming rather trendy. Traditionally, it’s been full of antique shops, but now it’s chock full of modern design and arts shops as well. 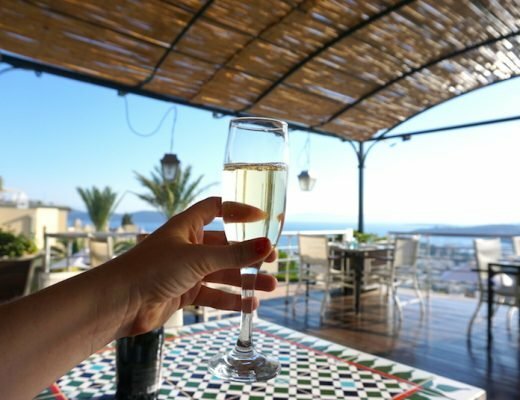 In Çukurcuma, I stayed at the fantastic Hammamhane, which is a boutique apartment-hotel that was originally a hammam, and the sister hotel of Peradays. I’d say it’s a touch more upscale than Peradays but with the same coziness and supremely helpful management who make you feel more like guests than clients. Guys, believe me when I tell you that I would seriously move into tomorrow. 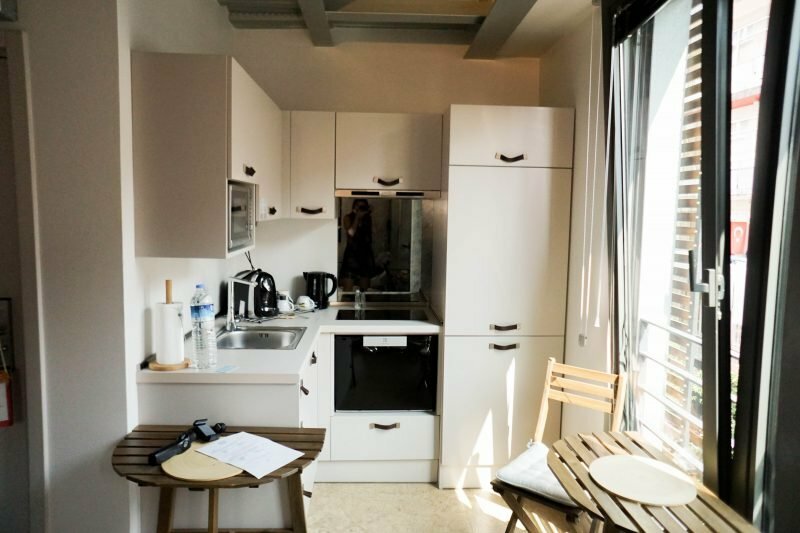 I mean, each room has a built-in washer-dryer and dishwasher — my inner New Yorker heart rejoiced a million times, and I briefly considered looking up if Istanbul granted squatters’ rights. 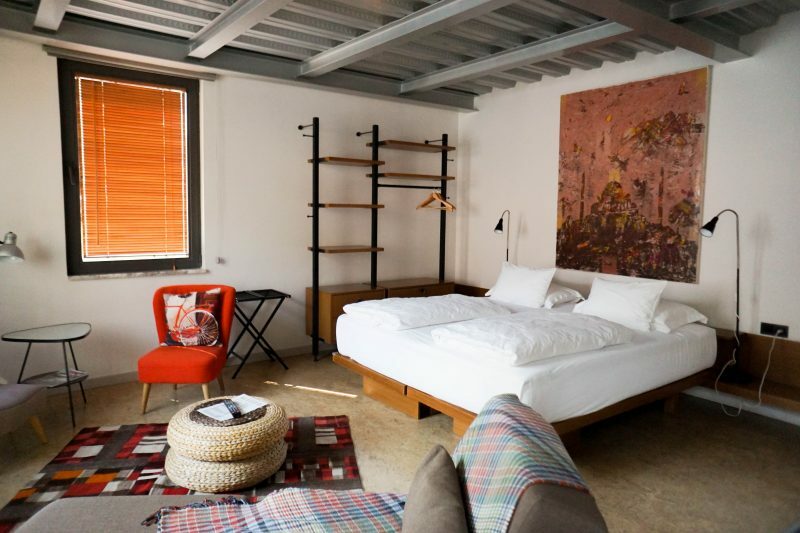 In addition to a fully functioning kitchen, the rooms offer modern design perfectly in keeping with its ultra-cool surroundings, a super comfortable bed, and one of the best and most generous breakfasts in all of Istanbul. They’re currently renovating their in-house hammam, but when it’s ready, I’m certain I’ll be back. Check availability of Hammamhane here. In my opinion, fears of Istanbul are highly overblown. I don’t think Istanbul is any more dangerous than other major European cities like London, Paris, Barcelona, etc. Keep an eye on the political situation, avoid protests, and keep aware as you would anywhere else. That said, I always travel with travel insurance and Istanbul is no exception. It protects you from everything from theft to injury to illness to baggage loss and beyond. I use and recommend World Nomads for their generous coverage and affordable prices. Get a free quote for your trip here. Istanbul is quite secular in mentality, and there is no reason to dress any different when you are in Istanbul than you would anywhere else in the world. The rest of Turkey is more conservative to varying degrees. Most mosques will have clothes you can borrow if you are not wearing appropriate clothing and would like to enter. As a solo female traveler I feel quite comfortable in Istanbul. Turkish men are a little flirtacious but generally very respectful – especially when comparing them to men in the U.S., Western Europe, and Central America. On a scale of 1 to 10, Southeast Asia (no street harassment) to Cuba (constant street harassment), I’d put Istanbul at a 3. Taxis in Istanbul can be scammy, so I recommend getting a local SIM card and using Uber during your stay. English is becoming way more widely spoken in Istanbul compared to my first visit in 2012. That said, learn a few words of Turkish before visiting as it is the polite thing to do. Duolingo even offers Turkish! Note: I was a guest of Peradays and Hammamhane on my most recent trip to Istanbul. All opinions expressed in this ridiculously long post are entirely my own! This post also contains affiliate links. 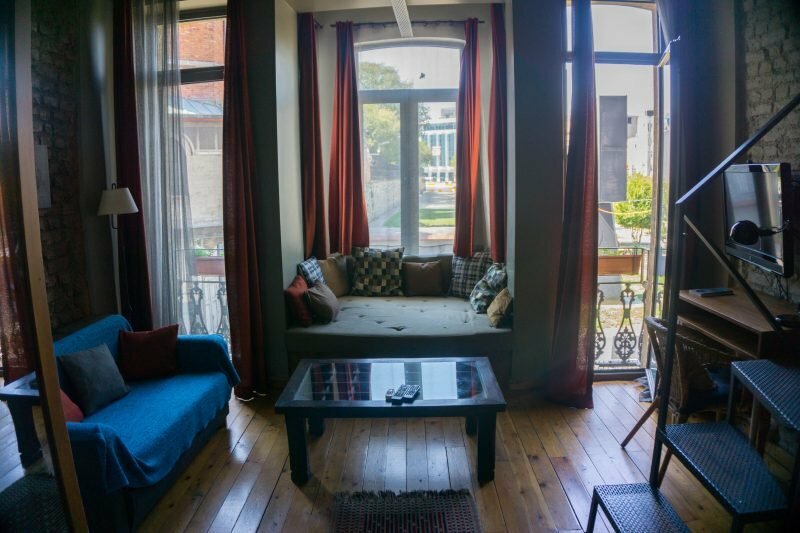 you stayed at some awesome places in Istanbul! i feel so bad that i never really spend more than a few days in Istanbul when i pass through. I’ve never just ‘gone to go’. and now thanks to the gov’t, i can’t really go for fun. Great post and pics!! Thanks! <3 They were really fantastic and the staff in both were so lovely that I'd come back for that alone. You've really got to give Istanbul a proper visit sometime soon -- if not for the coffee scene alone! But hey, you know that the visa situation is back to normal between Turkey and the US, right? Just got fixed a month ago 🙂 Great timing as it'd be such a shame to be living in Sofia and not have the option to visit. I wish I would have been able to read this post before I went to Istanbul last year! Although I am hoping to revisit – Istanbul is an incredible city and I felt like I barely scratched the surface after 5 days. Honestly, I feel the same way even after having spent like two weeks there. I’ve barely ever seen the Asian side with the exception of Kadikoy. It’s such a fantastic city, and it’s so constantly evolving and changing, it makes it feel different every time. When I went in 2012 and went back in 2017, I stayed in the same neighborhood – only 3 or 4 blocks away – but it felt like two totally different cities. Incredible, really. Hi. Great blog! Do you have other hotel suggestions in Istanbul? I’ve only stayed at those two hotels (and on my first stay I stayed at Aga Hamam Hostel) so no personal experience with other hotels, sorry. There’s a lot of great options in Istanbul though! Choose something in Beyoglu, preferably Pera or Cihangir, as those are the best neighborhoods in my opinion. Wow! I am utterly impressed by the detail of this itenerary! Thank you so much for literally planning my whole time in Turkey, which I will be going to in three weeks! Much love and safe travels! Hi Mel, so glad this was able to help you!! I hope it will serve you well and that you have an excellent time in Istanbul – it’s one of my favorite cities. Your post and the photos are amazing. I was planning to go to Istanbul but still have got some concerns. How about safety issues there? Hi Amy! I felt very safe there and think Istanbul is about as safe as any major European city like Barcelona, Paris, or London. I never felt any reason to fear for my safety. Turks are quite hospitable and friendly and the risk of terrorism is, in my opinion, way overblown. Istanbul feels very safe to me. Great post!! Thanks for all the information! Hi, thanks so much for the information! 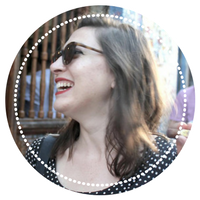 I’m also a solo female traveler and I really appreciate all the little tips and the great explanation about the city! Great blog Allison. Thank you for sharing this. I plan to go in July with my entire family. 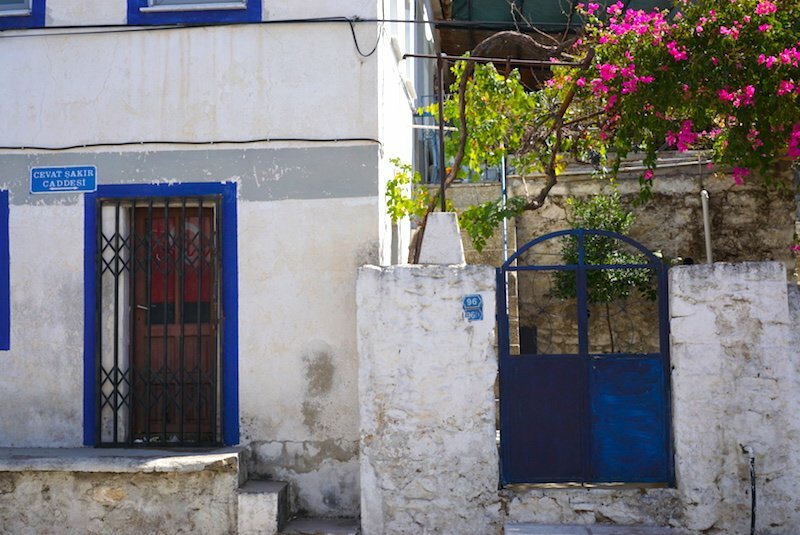 Do you recommend Bodrum to along with Istanbul? I liked Bodrum but didn’t love it. I’d be inclined to recommend Fethiye or Antalya instead but I haven’t been to either, personally! Did you buy a musekart pass or a tourist pass? Personally, I didn’t buy either as I’ve been to Istanbul 3 times and did everything on this itinerary over the course of ~3 weeks I’ve spent in the city. I’m not sure which offers the better value, sorry!